The beguiling central Italian region of Tuscany is blessed with an abundance of superb gardens. Many were created by wealthy aristocratic and banking families during the Renaissance when gardens, inspired by classical ideals of order and beauty, came to be seen as places of contemplation and pleasure and as a way of demonstrating the owner’s taste, power and wealth. Other gardens, drawing on this tradition, are more recent creations, designed for the most part in the early 20th century for expatriates who bought and restored historic estates in and around Florence. The magnificent Tuscan countryside, some of the most picturesque and distinctive in Europe, provides a dramatic background to many of the properties. We search out the best of Tuscany’s gardens on this tour, as we journey from Pienza, a gem of a Renaissance town in the scenic Val d’Orcia, through the vineyards of Chianti and Montalcino, to Florence, one of the world’s great cities and a treasure trove of Renaissance art and architecture. 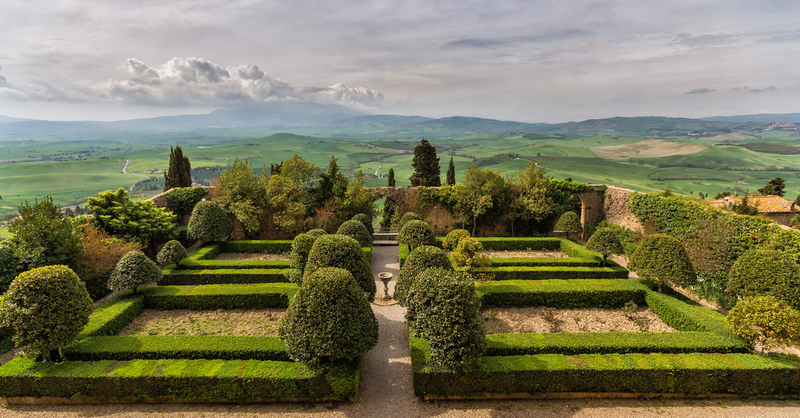 Highlights include the gardens at Villa Cetinale and La Foce, buried deep in unspoiled countryside; the elegant terraced villa gardens at Gamberaia, Medici di Fiesole, and La Pietra in the hills above Florence; and the wonderful Baroque gardens at Villa Reale di Marlia, a longtime personal favorite. For good measure we include two nights in Frascati at the end of the tour, from where we visit the exquisite gardens surrounding the Pope’s summer palace at Castel Gandolfo, only recently open to the public. As usual we get off the beaten track at every opportunity, explore unspoiled medieval hilltop towns and villages, and sample Tuscany’s rich culinary and wine heritage.